"Theyâ€™re youngâ€¦ theyâ€™re in loveâ€¦ and they kill people." 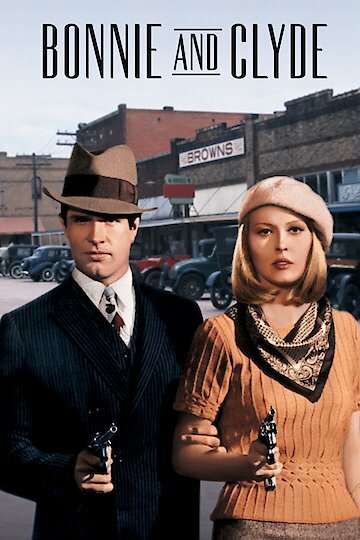 The film entitled Bonnie and Clyde is about the adventures of Clyde Barrow and Bonnie Parker. Clyde and Bonnie meet under some funny circumstances. Clyde is struggling to steal a car belonging to Bonnie’s mother and Bonnie finds the act interesting. Bonnie is a waitress who does not like her job and is looking for a way and a good excuse to quit working as a waitress. She thinks the best option is to join Clyde in his mischievous deals and work closely with him. The two get involved in acts but since they do not have great expertise they do not succeed in any of their missions, though they find their adventures interesting and exciting. Clyde and Bonnie come across a guy named Moss. Moss works at a gas station as an attendant. They also hook up with Buck who is Clyde’s elder brother and Blanche who is Buck’s wife. Bonnie and Blanche do not get along during their first encounters and they develop hatred for each other as the days go by. Bonnie considers the presence of Blanche in the gang is not healthy for them as she does not trust and dislikes her. Bonnie and Clyde star robbing banking institutions, they become more fierce in their actions. During one of their operations in which Moss is also involved, Clyde shoots the bank manager after which the gang is pursued by police officers. The team gets raided during which Buck and Blanche are injured. Bonnie, Clyde and Moss escape but unfortunately Blanche loses her sight. While in detention Blanche accidentaly reveals Moss’s true identity to the authorities who tricked her to do so. Bonnie, Clyde and Moss are tracked down by Hamer while they are hiding in Moss’s father’s house. Ivan Moss who is blaims Bonnie and Clyde for corrupting his son makes a deal with Hamer. He pretends to have a flat tire and while Bonnie and Clyde go to assist him, Hamer and his team attack and shoot them. Bonnie and Clyde is currently available to watch and stream, download, buy on demand at Netflix, Amazon, Vudu, Google Play, FandangoNow, iTunes, YouTube VOD online.